Vaccination is an integral part of routine health care for cats. Regular vaccination guarantees that your feline friend maintains optimum health and wellness throughout its lifespan. Vaccines for cats help in the prevention of serious and life-threatening diseases. Here are the core vaccines that your cat should have by now. If you still haven’t had your cat vaccinated, it’s not too late as these vaccines may be given to them at any stage of life. Feline Panleukopenia or Feline Distemper is very common among kittens but may also be seen in older cats. Given this, it is important that kittens are vaccinated for Feline Distemper as this medical condition is highly contagious in nature. Feline Distemper, when left untreated, can lead to death. Pet parents are advised to have their kittens vaccinated until 16 weeks old. Injectable vaccines that contain strains of herpesvirus(FHV) and calicivirus(FCV) are commonly recommended by veterinarians for kittens and are normally administered with Feline Panleukopenia vaccine. As early as 6 weeks of age, kittens may already be vaccinated with FHV and FCV vaccines. Pet parents may also opt to have their fur babies administered with vaccines in droplet form in the eyes and nose. Other respiratory diseases that can be prevented with the help of CORE vaccination are chlamydia psitacci and pneumonitis. Cats are susceptible to catching rabies varies. This is especially true among those who are allowed to wander outdoors by their pet parents. 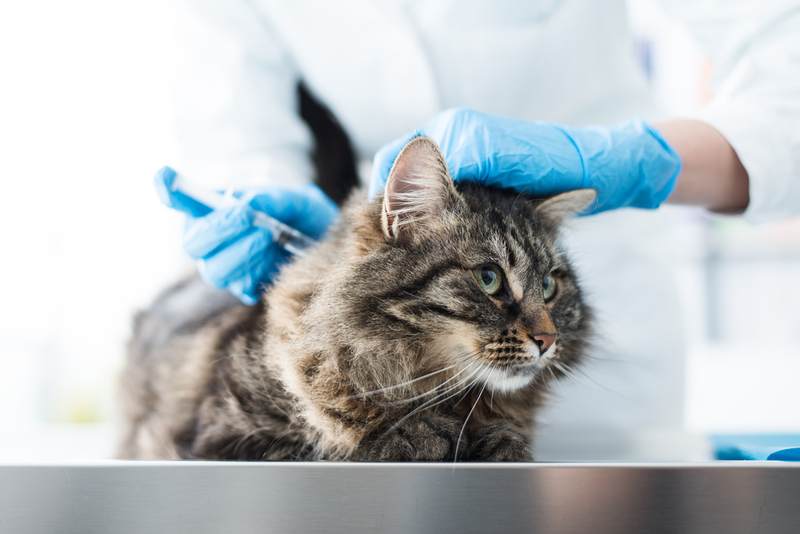 The number of rabies in cats in the United States has risen in recent years, thus this vaccine is almost, always one of the first vaccines administered to cats. Rabies is a deadly virus that attacks the nerve tissues. Infected animals are known to withdraw from socializing with people and other cats. There are also cases that rabid cats become more aggressive than usual. Rabies is a violent, deadly, and incurable. This makes it all the more important for pet parents to get their cats vaccinated before it’s too late. Cats are ideally vaccinated at 16 weeks of age or older. Booster shots, on the other hand, are given a year after the initial dose and then after every three years for succeeding booster doses. Cats, especially those that are always outdoors, are highly susceptible from getting infected with FIV by other cats. Feline Immunodeficiency Virus just like Human Immunodeficiency Virus targets the immune system. Once infected, cats develop a weak immune system which in turn makes them highly susceptible to contracting other illnesses too. An FIV vaccine is ideally given together with Core vaccines and is then followed by two more boosters spaced two to four weeks apart. These vaccinations are relatively inexpensive and are available in veterinary clinics and even in animal shelters. I No shark attack without leaving a warning sign. Sharks often give a sign before attacking people. Some of these signs include pointing their pectoral fins down, arching their backs and raising their head. II A lot of people are killed by lightning and bee sting than they are killed by shark attacks. More than 30 people die every year around the world from shark attacks. This means everyone has a one in 300 million chances of being killed by a shark. The human attack often occur after a shark mistakes a human for seal or other sea animals. III Different species of sharks have a movable transparent nictitating membrane. This membrane helps protect and cover their eyes when they are eating and also attacking. IV Most of the sharks attack very far from the shore. Most of their attacks are about 100 feet from the shore. These attacks happens everywhere around the world, but they occur mostly in South Africa, North America and Australia. V Sharks are not like fish. They do not have a swim bladder that can keep them afloat. Instead they have a large oil-filled liver. The basking shark spend a lot of time on the water surface because they have a massive liver. VI The shark finds it very easy to swim as long as its back is mostly under water. No water is too small for them. A nine foot long distance bull shark can swim in only two feet of water.